Some 823 million Chinese, about 2.5 times the US population, sent or received digital red envelopes through Tencent's popular instant messaging tool WeChat during the seven-day Spring Festival holiday, a 7.1 percent increase year-on-year. Sending red envelopes with money is a Spring Festival custom symbolizing happiness and good luck, but people are increasingly using digital currency. Beijing is the city where people sent and received the largest amount of WeChat red envelopes, followed by Guangzhou, South China's Guangdong Province and Southwest China's Chongqing Municipality. Among them, post-90s sent and received the biggest amount of red envelopes, according to the report WeChat sent to the Global Times on Monday. Some 26,000 companies tailored the red envelope cover for their 20 million employees. Meanwhile, outbound travelers had a chance to receive tailored-cover red envelopes when they made purchases overseas through WeChat. WeChat launched its red envelope function before the 2014 Spring Festival, and an estimated 5 million people used it that year. Media reports quoted Alibaba's founder Jack Ma Yun as saying, "[WeChat red envelope] was like an attack on Pearl Harbor" on Alipay. WeChat backed the 2015 Spring Festival Gala of China Central Television (CCTV) and rivaled Alipay. 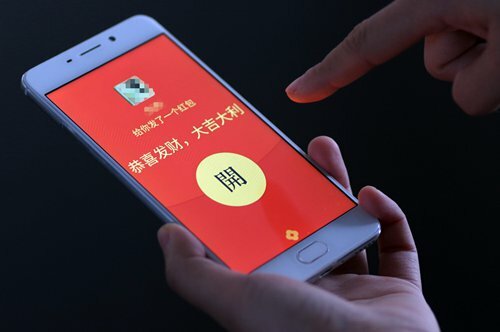 This year saw new players like Baidu, which provided red envelopes worth 900 million yuan ($133.5 million) and saw 20.8 billion transactions on its app during the CCTV Spring Festival Gala in the run-up to the Year of the Pig. Short video platform Douyin, the Chinese version of TikTok, allocated 500 million yuan for app users who collected all seven music notes. Users can get the note by inviting new users or participating in special online activities. Wu Ying, 28, participated in the "red envelope war" on Alipay, Baidu and Douyin, but received no more than 10 yuan in all. "WeChat has strong social media features, and its red envelopes contains "love and care between relatives and friends," she said.